Even if you don't "praat die taal" you've heard these words before – and while there's no real English alternative, you know exactly what they mean . . . The deliciously seasoned dried meat is a South African delicacy, and we've been making it for centuries. The process of curing meat with salt and drying it out was a preservation process used by both indigenous local inhabitants and settlers alike. Dutch settlers favoured using pepper, coriander and cloves in their curing process, which gives biltong that distinctive spicy flavour we know and love. According to Biltongmakers.com, the word is derived from the Dutch bil (buttock) or meat and tong or strip. While foreigners might be tempted to call it beef jerky, like the salty snack Americans favour, anyone who's tasted both will tell you there's just no comparison! Referring to a lekker braai as a barbecue is practically offensive to a proud South African – particularly because, not only are we the best braaiers in the world, our people are among the earliest to have done so. In fact, excavations of the Cradle of Humankind fossil site have uncovered burnt animal bones that appear to have been charred on a fire that was fed with wood repeatedly, millions of years ago. And we've been doing it ever since! The beloved pastime was already popular before loadshedding and we have almost a whole month dedicated to it! The word is believed to have been derived from the Dutch braden ? (to roast). Ask South Africans abroad what they most miss about their homeland – we guarantee boerewors is on their list! The name of this local favourite is derived from the Afrikaans words boer (farmer) and wors (sausage). Smeared in melting butter, hot-off-the-coals, mielies (sometimes spelt 'mealies') are a favourite side dish at weekend braais (see above). And no,"corn on the cob" doesn't quite cut it! Interestingly, the Afrikaans word is derived from the Portuguese milho (maize or millet) and the Latin milium. Speaking of mielies . . . If you grew up in SA, chances are you got a large part of your daily diet from good ol' pap! Best served with boerewors (see above), this porridge-like dish is made from ground maize, or mealie meal. It's believed to have been derived from the Latin pappare (to eat). Do we even need to explain this? It's a word so synonymous with South African culture most tourists will have had at least one well-meaning local attempt to teach them to pronounce it at some point. "No, you must rrrrroll the 'r' at the end . . ." The word comes from the Dutch lekker, which translated directly means delicious! A great spot for lekker chats, boerewors braais . . . A veranda or patio in front or behind your house. Irritated, more irritated, gatvol. The emotive word is the superlative only South Africans know about. The word is derived from the Dutch gat ? (hole) and vol ?(full). Which, if you don't think about it too hard, makes perfect sense. When you're angry, you might want to smack someone. But when you're gatvol (see above), you'll want to KLAP them. Note: "klapping" is generally never a good idea. But if you say it, you might feel better. It's a very satisfying word. Italians make meatballs, South Africans make frikkadels! What's a cocktail party without a lekker frikkadel to dip in some sweet chilli sauce? The word is derived from the French word for meatball, fricadelle. Think your Afrikaans is good enough to win big? 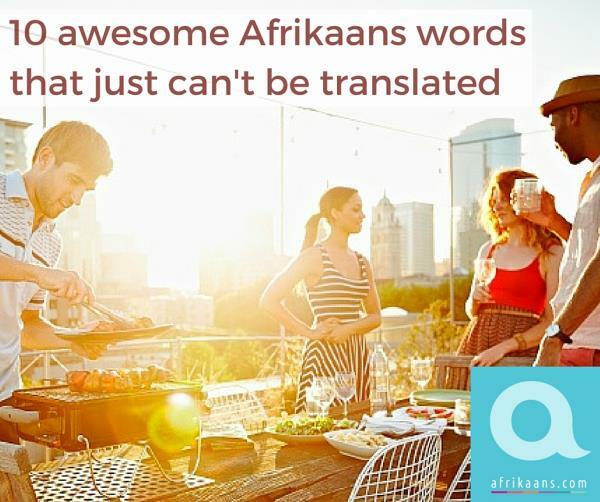 If, for example, you share the oddest/quirkiest words you’ve ever heard or used in Afrikaans you could win R10 000! 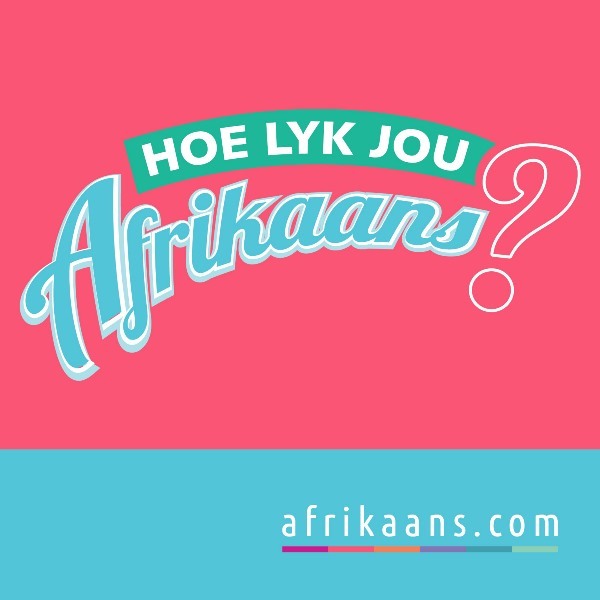 Visit www.afrikaans.com/wen to enter. Quiz: How well do you know Die Taal?